They say death and taxes two inevitable elements of life, the later being added to modern life. Some say an extremely high tax rate is as painful as death while some others opines any tax rate greater than 0 percent is considered excessive. The rate of taxes keeps on changing. In France, a proposal has been made to increase the tax rate for those earning more than $1.23 million to 75 percent from the 48 percent of present. Again in the United States, the highest tax pay is 35 percent which is also proposed to increase to 39.6 percent. This formed one of the most contentious issues during the last presidential elections in the country. Only a minor .046 percent of the population in France will be affected by the proposed hike, when it comes to the United States majority of the people will be affected. The reason being the increasing billionaire businessmen in the country. The last time the United States had such a high tax rate was during the Clinton administration. The economic prosperity was immense at that time. 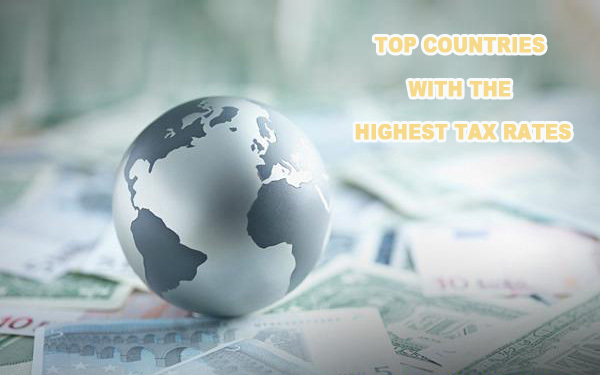 Here are the top 10 countries with the highest tax rates in the world. Have a look! Ireland has the lowest corporate tax rate in Europe with only about 12.5 percent. The top marginal rate has been 45 percent since 2008. However other taxes on gifts, inheritances and capital gains are rated at 30 percent. The social security tax on the other hand is only 4 percent. The top tax rates in Finland were 53.5 percent in the recent past which is cut short now. However, the citizens pay municipal tax of 21.5 percent, church tax of 2 percent and capital gains at 28 percent. The government is also planning on increasing taxes for those with high income and pension owners and those with inheritances above $1.3 million by 2015. The income tax rate in the United Kingdom is 45 percent. However, citizens earning less than $14,300 are exempted from paying taxes. The social security taxes to be paid are 14 percent while the capital gains reach 28 percent. Japan pays the highest income tax in the Asian continent with an average of only 23 percent. The high income tax is charged for those with $228,880 income or more. The average income in the country however is $53,200. Austria is one of the best places to make a living in the world. However, you need to pay heavy taxes. Along with the basic income tax, the residents have to pay a social security rate of 18 percent. Also the bonus payments are charged 6 percent, and capital gains tax is at 25 percent. For those who want to keep their money safe in the Swiss banks is also taxed through a special agreement between the Swiss and Austrian government. The tax rates in Belgium are also as high as its neighboring regions. It also charges extra tax rates on various fields like social security rate of 13 percent for employees and 35 percent for employers, municipal taxes of up to 11 percent, and capital gains tax of up to 33 percent. The country is voted as the highest tax payers in the world with an individual being able to enjoy only 45 percent of his salary. Average income is $45,037. The Netherlands pays the highest tax rate compared to the whole of Europe. The regional average comes to 45.7 percent. The government also charges other taxes like capital gains tax of 25 percent, land transfer tax of 6 percent and inheritance tax of up to 40 percent. However, the average income in the country is $57,000. The top marginal rate of income tax was 62.3 percent in 2008. The country taxes dividend income by 28 percent and capital gains by 42 percent. Even the Danish church is not left out. They pay tax ranging from 0.4 to 1.5 percent. Again, gifts to relatives over a certain threshold amount also need to pay a 15 percent tax. Citizens of Sweden get free education and subsidized healthcare. Every individual is guaranteed a basic pension. The public transportation mode is subsidized too. The high standard of life style is compensated by the government with its aggressive tax schemes. Those with extremely high incomes need to pay 56.6 percent of tax. These rates are for those whose income is more than $85,841. This is not much of a concern as the average income of the people in the country is $48,800. Sweden also charges 30 percent tax on investment income along with significant percentage on property holdings and social security as well. The country has the highest standard of living in the whole of Caribbean. The Dutch territory needs to pay the highest income tax rate in the world. During 2007, the rate used to be 60 percent. For the married couples who meet the income requirement are charged a little less at 55.85 percent. They also need to pay a 25 percent tax on capital gains. The rate is considered as double than the average rate in the Caribbean if we consider the zero income tax regimes in the Bahamas, Bermuda and Cayman Islands.